Ananth Grama is the Director of the Computational Science and Engineering program and Professor of Computer Science at Purdue University. He also serves as the Associate Director of the Center for Science of Information, a Science and Technology Center of the National Science Foundation. 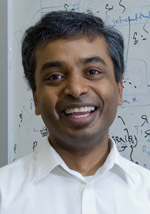 Ananth received his Ph.D. from the University of Minnesota in 1996 and has been at Purdue since. His research interests lie in parallel and distributed systems, numerical methods, large-scale data analysis, and their applications. Ananth is a recipient of the National Science Foundation CAREER award (1998), University Faculty Scholar Award (2002-07), and is a Fellow of the American Association for the Advancement of Sciences (2013). White Auditorium, Cooley Building, 2355 Bonisteel Blvd. Modeling atomic and molecular systems requires computation-intensive quantum mechanical methods such as, but not limited to, density functional theory (DFT). These methods have been successful in predicting various properties of chemical systems at atomistic detail, albeit at significant computational cost. Classical molecular dynamics techniques, on the other hand, lack essential chemical properties such as reactivity and charge transfer. Recently proposed reactive force fields such as ReaxFF try to achieve essential quantum properties, while retaining computational simplicity of classical molecular dynamics. Implementation of reactive force fields, however, presents significant algorithmic challenges, including scalable solvers and specialized preconditioners. In this talk, we present the design of PuReMD (Purdue Reactive Molecular Dynamics), a unique parallel reactive molecular dynamics code. We describe various data structures, the charge equilibration solver at the core of the simulation engine, and the associated parallel formulations on messaging, single-GPU, and GPU Cluster platforms. We comprehensively validate the performance and accuracy of PuReMD on a variety of physical systems and compute platforms. We show excellent per-timestep time, linear time scaling in system size, and a low memory footprint. We also show excellent scaling properties up to thousands of computational cores and tens of GPUs. PuReMD is available over the public domain and is currently being used at over 150 labs worldwide to model diverse systems ranging from oxidative stress in bio-membranes to strain relaxation in Si-Ge nanorods. We conclude the talk with a brief discussion of these applications.